Really well located, just down the road from Freedom Square and the Old Town. 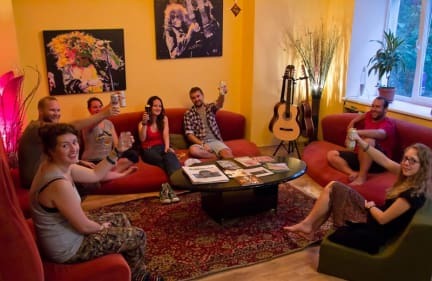 Very relaxed atmosphere, with great kitchen facilities and jam sessions every few nights or so. Highly competent staff, really great! Great hostel. Central location with friendly staff. We stayed in the big dorm which was good other than the fact that there were't individual lights so made it a little difficult with everyone waking up at different times. Excellent hostel near the action in Tallinn. Super chill, comfortable main lounge. Friendly confines in the music area and stimulating guests and staff. I came at the quieter change towards off season, but it's a cool place, will stay again. I had a great time here. The staff were very helpful and made my stay here great. Their was a little bit of rust, ‘muck’ in the bathroom or bedroom I think it was but nothing to worry about just a little that needed removing. It did lack atmosphere but that was because of the other travellers their, the staff were great! Absolutely amazing! The hostel was really cute and there were a lot of instruments you could play and books you could read. Staff was nice and helpful. Athmosphere was amazing. The bathroom smelled a little moldy but otherwise it was good. Beds were comfy. I really enjoyed my stay at Euphoria. Pretty chill, nicely decorated place, clean, and the staff was really nice. If you’re looking for a more relaxed vacation at an affordable price this place is great. The staff was great and gave me great advice on which places to go and a couple tips on the best restaurants. The location was great- right next to the old town and the hostel itself had a fun atmosphere. Only minor problem was that my locker door was not secure. I could pull it open with my hands. Fabulous location right by freedom square - less than 30 mins walk from the port - and the manager is brilliant, he did all he could to make sure our stay was good. There were some issues though... Some members of staff were sleeping in the dorms and using the kitchen, which was small, with us. They often left the kitchen in a mess. In the dorm there are no individual lights or plugs but extension lead were provided.